On January 22, 2013, three innovative musicians recorded at Studio de Meudon in Paris, France for nuscope recordings. A dreamer and an adventurer in music, pianist/composer/producer Benoît Delbecq is a truly original pianist who merges such seemingly disparate influences as Gyorgy Ligeti, John Cage, Steve Lacy, and even electronica into a new and refreshing style. His music and projects include works for theater, dance, literature, visual arts, and motion pictures. He has released about 35 records as a leader or co-leader among a discography of more than a hundred discs. Gerry Hemingway, now resident in Luzern, Switzerland, is a recipient of a Guggenheim Fellowship. He has had a long and admirable career, as he has been composing and performing solo, ensemble, and orchestral music since 1974. As bandleader, Hemingway has led various quartets and quintets since the mid-1980′s. He has also performed with the great Anthony Braxton, Ray Anderson, and many others. For nuscope, Hemingway previously recorded the challenging Subsymbolism (CD 1010) with Georg Graewe and Ernst Reijseger. This recording, which was recorded and mixed in the 24 bit domain, features an 6-panel wallet with liner notes from Montreal-based journalist Marc Chenard, and cover photography by Mark Mushet, who provided the cover photography for Delbecq’s fine trio CD on the psi label with Evan Parker and Francois Houle. It would be difficult not to hold high expectations from a meeting involving these three musicians. If Blaser has made his mark on the scene over the last few years as an engaging leader (especially in his work inspired by masters of Ancient Music), it’s still hard to imagine what sort of three-way relationship he could achieve in the company of Benoît Delbecq and Gerry Hemingway, the latter recently paired in a stunning double trio with Fred Hersch (reviewed in issue 647). There is some magnificent work to be heard here. Composer credits are evenly divided between them, yet their individual contributions cannot be easily untangled. Ultimately, the written parts simply alternate with the improvised ones in a very economical way, though Delbecq’s works tend to mask the notated materials or delay their appearance until the very end (“Lask,” “Long”). But then again, the remaining pieces come across as if they were collectively created. The album’s title track, a triptych composed by Hemingway, opens with a remarkably swaying ostinato that allows the percussion and the prepared piano to achieve a texture that only Delbecq is capable of producing. The last part of the trilogy (“Fourth Landscape III”) is structured on seven short sequences, each based on new materials and an exchange of roles between the players. But these ingredients may well also apply to the rest of the recording where the overall effect is enhanced by the diversity of playing situations, the layering of sounds and nuances. There is a particular emphasis given to texture. While this music may throw some off at first, given its dense, highly concentrated and meditative character, a close listen will heighten the auditory pleasure. The liner notes by Marc Chénard, written in a very accessible manner for anyone with fluency in English, do provide the listener with some valuable insights. But if you so prefer, then start with the piece “Outremer” and just let yourself be carried away by the strangely vivid and off-kilter mechanics that occur under the intertwining melodies. 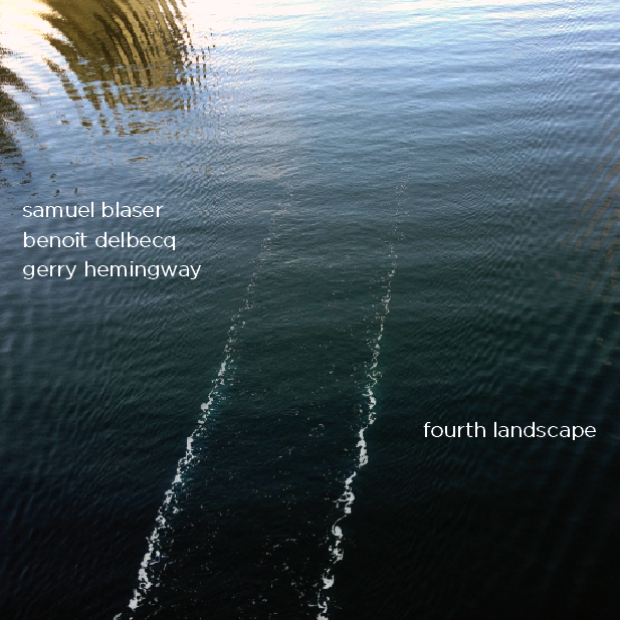 With French pianist Benoît Delbecq completing the trio, Fourth Landscape features interpretations of pieces by all three band members…Hemingway’s three-part “Fourth Landscape”, which gives the session its name, actually is a suite. Ingenious throughout, it manages to work herky-jerky percussion, descriptive and panoramic keyboard chords and clicks, plus fierce tonguing from Blaser into a thematic exposition. 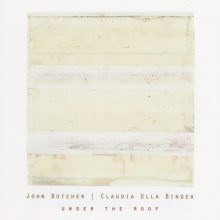 Cunningly, the third section uses silences and insinuations of plunger brass and piano patterns to solidify the narrative with the drummer’s whacks, sweeps and rubs confirming the melding. 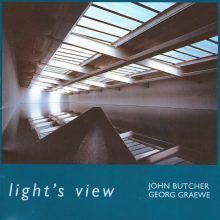 Graceful and mellow arrangements, which bond the instruments, characterize most of the rest of the session. Despite this, the interaction is such that none of the participants has to abandon contemporary technical extensions or power moves for romantic understatement. 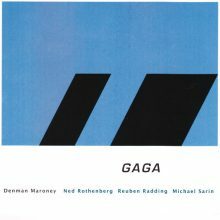 Delbecq finds specific places for tone poem pianism; Hemingway for propelled clunks and pops; and Blaser is able to dip into near-bass trombone-weighted slurs plus arpeggiated sharpness while alternately accompanying or soloing. Overall the contributions from each man join to paint a complete sonic picture on this CD. Review from June 2014 edition of the JazzWord website.